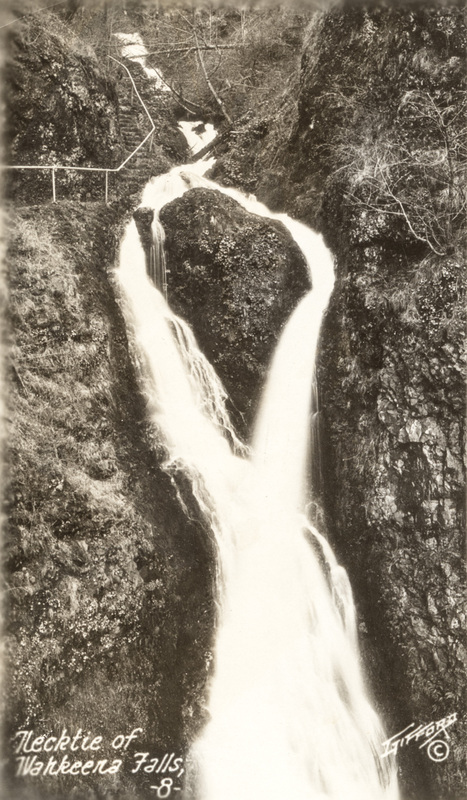 This Gifford postcard of Wahkeena Falls identifies a feature called the "necktie" which I have never seen. It doesn't match any modern views I can find, so perhaps the falls have changed in the past 100+ years? Would the appearance not depend on the time of year with various amounts of water coming down? I think it would be more appropriate to call it Necktie Fall of Wahkeena Creek. If this is the falls I am thinking of you have to scramble down a steep user made trail to reach the creek and a view point. Longshot is correct, a good view is from a dangerous off trail location that is NOT recommended. "It's kind of interesting how this propagated. There actually is no Necktie Falls - what you're seeing from the fenced viewpoint is the top of Wahkeena Falls itself. Back in the early 1900s when that trail and viewpoint were actually maintained, that part of the falls was known as "The Necktie" or "The Necktie of Wahkeena". Somehow at some point in time it became assumed that it was a different waterfall, probably because it's not exactly obvious what you're looking at given how obstructed Wahkeena is when viewed from below. Greg Plumb then made the assumption in his "Waterfall Lover's Guide" books that the name Necktie applied to the smaller - clearly separate - waterfall upstream because (presumably) it was referenced in certain older literature but there was never any sort of signage to indicate what the name actually applied to. I've been referring to the smaller one as Little Necktie Falls for years now in homage."